This is a combination of theatre games that I used for a summer workshop with 7-12 year olds and it produced some wonderful results and we had a great afternoon of fun and creativity. As well as the games that I have noted, I also used “Group Hug” at the beginning of the session to start with a nice cosy feeling! After machines; I played “Yes… let’s!”, I put in a “Mimic Walk” and I also used “Hands On Knees” to decide which group were to go first… I was running a two hour session so; I suppose I had time to throw a few more games in! I took a big box of costumes and props for the Scene Select exercise; I printed out a number of scene titles and the groups chose one at random and they had to use the costumes and props to bring it to life – they had so much fun; there was so much creativity in the room; so many smiles. 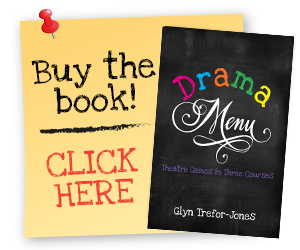 We all had a great afternoon… thanks DRAMA MENU!